As springtime calls people and snakes alike to the outdoors, encounters with snakes become inevitable. California has a variety of snakes, most of which are benign. The exception is California’s only native venomous snake – the rattlesnake. California rattlesnake species include the northern Pacific rattlesnake (in northern California), and the Western Diamondback, Sidewinder, Speckled rattlesnake, Red Diamond rattlesnake, Southern Pacific, Great Basin rattlesnake and the Mojave rattlesnake (all found in Southern California). Though rattlesnakes are dangerous if provoked, they also provide humans with a tremendous service. They eat rodents, other reptiles, and insects, and are in turn eaten by other predators. In California rattlesnakes are found from sea level to the inland prairies and desert areas and to the mountains at elevations of more than 10,000 feet. Enjoying the outdoors means learning how to avoid contact with rattlesnakes. Generally not aggressive, rattlesnakes strike when threatened or deliberately provoked, but given room they will retreat. Most snake bites occur when a rattlesnake is handled or accidentally touched by someone walking or climbing. The majority of snakebites occur on the hands, feet and ankles. Rattlesnakes can cause serious injury to humans on rare occasions. 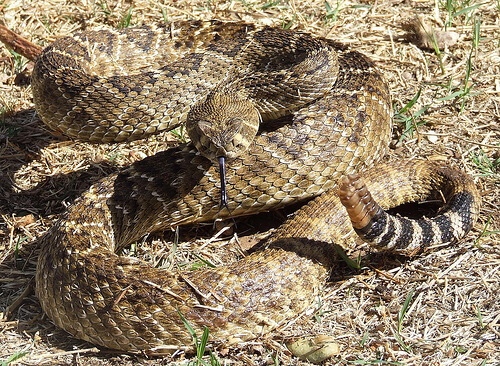 The California Poison Control Center notes that rattlesnakes account for more than 800 bites each year with one to two deaths. Most bites occur between the months of April and October when snakes and humans are most active outdoors. About 25 percent of the bites are “dry,” meaning no venom was injected, but the bites still require medical treatment. The potential of running into a rattlesnake should not deter anyone from venturing outdoors, but there are several precautions that can be taken to lessen the chance of being bitten when out in snake country – which is just about anywhere in California. 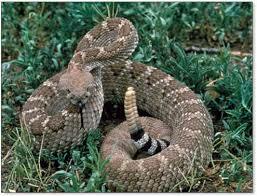 First, know that rattlesnakes are not confined to rural areas. They have been found near urban areas, in river or lakeside parks, and at golf courses. 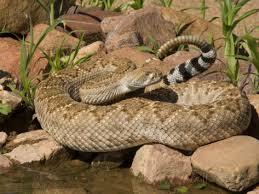 Be aware that startled rattlesnakes may not rattle before striking defensively. There are several safety measures that can be taken to reduce the likelihood of startling a rattlesnake. * Never go barefoot or wear sandals when walking through wild areas. Wear hiking boots. * When hiking, stick to well-used trails and wear over-the-ankle boots and loose-fitting long pants. Avoid tall grass, weeds and heavy underbrush where snakes may hide during the day. * Do not step or put your hands where you cannot see, and avoid wandering around in the dark. Step ON logs and rocks, never over them, and be especially careful when climbing rocks or gathering firewood. Check out stumps or logs before sitting down, and shake out sleeping bags before use. * Never grab “sticks” or “branches” while swimming in lakes and rivers. Rattlesnakes can swim. * Be careful when stepping over the doorstep as well. Snakes like to crawl along the edge of buildings where they are protected on one side. * Never hike alone. Always have someone with you who can assist in an emergency. * Do not handle a freshly killed snake, it can still inject venom. * Teach children early to respect snakes and to leave them alone. Children are naturally curious and will pick up snakes. Many a useful and non-threatening snake has suffered a quick death from a frantic human who has mistakenly identified a gopher snake, garter, racer or other as a rattlesnake. This usually happens when a snake assumes an instinctual defensive position used to bluff adversaries. A gopher snake has the added unfortunate trait of imitating a rattlesnake by flattening its head and body, vibrating its tail, hissing and actually striking if approached too closely. A rattlesnake is a heavy-bodied, blunt-tailed snake with one or more rattles on the tail. It has a triangular-shaped head, much broader at the back than at the front, and a distinct “neck” region. The rattlesnake also has openings between the nostrils and eyes, which is a heat-sensing pit. The eyes are hooded with elliptical pupils. Additional identifying characteristics include a series of dark and light bands near the tail, just before the rattles which are different from the markings on the rest of the body. Also note that rattles may not always be present, as they are often lost through breakage and are not always developed on the young. Though uncommon, rattlesnake bites do occur, so have a plan in place for responding to any situation. Carry a portable phone, hike with a companion who can assist in an emergency, and make sure that family or friends know where you are going and when you will be checking in. The first thing to do if bitten is to stay calm. Generally, the most serious effect of a rattlesnake bite to an adult is local tissue damage which needs to be treated. Children, because they are smaller, are in more danger if they are bitten. Get to a doctor as soon as possible, but stay calm. Frenetic, high-speed driving places the victim at greater risk of an accident and increased heart rate. If the doctor is more than 30 minutes away, keep the bite below the heart, and then try to get to the doctor as quickly as possible. Each time a rattler sheds its skin, it can add 1 rattle. Because they can shed 2 or 3 times each year, the number of rattles is NOT indicative of age. Rarely are there more than 10 or 12 rattles because the outer ones wear out and break off. Rattlesnakes are not as dangerous or as frightening as most people think. They are, actually, shy and secretive animals who choose to avoid confrontations with people and are seldom seen. That does NOT mean, however, that you should not be cautious when hiking, back-packing, hunting or playing in the woods. If you do see one leave it alone because, if cornered, it will defend itself. How most people feel about rattlesnakes is based on the fact that they are not “cute and cuddly.” Because they are fierce looking and can bite, and because their warning rattle can startle us, we fear them as a threat and a menace to be avoided and, sometimes killed at all cost. Rattlesnakes, however, have been on this earth quite a bit longer than humans and serve a very important function in the natural cycle of things. Without them, for example, we just might be over-run with rodents. Eighty percent of a rattlesnake’s diet is made up of rodents and, in any given year, they might eat as much as 25% of the rodent population in any given area. If you, or someone you know, is bitten immobilize the affected area and cool with ice or cold water. Get the bite victim to a doctor as soon as possible. Do not try any of the old remedies like cutting the bite and sucking out the venom, or using a snakebite kit, or using a car battery to run a current through the affected area. Your best bet is a doctor and anti-venom. Even “Dead” rattlesnakes can bite! So caution is advised. Treat any rattler, dead or otherwise, with respect. If you think you hear a rattlesnake STAND STILL! Avoid jumping or running blindly. Look carefully until you locate the snake and then make your move. Remember that harmless snakes, moving in dry leaves and grass, can sound a lot like rattlesnakes rattling.